Work on the farm this summer was tough. The heat was relentless, and a 9 week heatwave took its toll on the Finnsheep. They battled the heat, despite being sheared twice in 6 months, and we battled with worms and parasites, despite de-worming twice in the summer, and the addition of diatomaceous earth to the their diet. However, despite all of this, the parasites flourished,and the sheep suffered. Not only did the heat affect the sheep, but also the chickens as they just had no energy to lay and decided that it was time to take a long vacation. And who could blame them! I felt like going on strike myself, but a farmer's work is never done and so the canning and freezing of the produce went on, the fleece was washed and spun, and all the plants and trees were constantly watered. One of two things that did flourish in the heat were my Angora goats that absolutely thrived in the heat, and slept at night dreaming they were back in their ancestral land of Turkey. The other thing was the blackthorn berries. My eyes lit up as soon as I saw the plump, black fruit, not for eating of course - which are absolutely vile and are so sour your face turns inside out if you do! - but for making sloe gin. Sloe gin is a delicious, traditional English liqueur made with the sloes, sugar and gin, and I put up 5 liters this year, and have allowed these to macerate and do their thing until just before Christmas when I will rack it off and place it in their bottles. Sloe gin is a pretty dark pink in the end, and delicious either drunk on its own, or mixed with Prosecco. I have given you the recipe below if you want to try it. Things have started to slow down now, although I have a mountain of fleeces that still haven't been washed and spun. There are fewer tomatoes, eggplants and peppers on the vines, the leeks are doing well, and the rest are recovering from the brutal summer, that will hopefully fare better next year especially my strawberries and my rhubarb. The story surrounding the strawberries this year, was rather a sad one. They started off beautifully. I have a strawberry bed 6 feet x 4 feet (yes, I am rather fond of strawberries), but then I had a slight altercation with my neighbor over something trivial. The upshot of that was the following weekend someone entered the vegetable garden in the small hours of the morning, stole all the strawberries, and then stripped all the flowers from the plants Due to the heat, they never recovered. Hopefully, after securing the area now with a strong fence, next season will be a happier one, all round! Halloween is round the corner, and so if you are carving pumpkins for the first time, or you are just looking for inspiration, you can hopefully find it here. We have some other exciting news to announce. Countryfarm Lifestyles has ventured into the world of publishing and there is a book called Country Christmas coming out soon. Watch this space! It will have recipes, information on Christmas decorations and crafts country-style, as well as some beautiful photos that will make this a coffee-table reference book for your holiday season. As soon as it is released I will give you the heads up on how to win 5 free copies, without purchase in our online contest, via Amazon. However, you will have to be quick. Last night we held a contest for a 5 free book giveaway, with a new book we had published through Drama Llama Press, on coloring in mandalas for adults. If you haven't tried coloring in as an adult for stress-relief, or even occupational therapy for someone trying to get fine motor co-ordination back, you should try it! The book is well priced to sell, and after it hit the bookshelves at Amazon yesterday, we sold 10 copies within hours, in addition to the 5 we gave away. Which we were thrilled to see. So enjoy this newsletter, the recipe and the article on whether it is possible to make money from chickens, and send me any questions you may have, and I will try and get back to you as quickly as possible. At the moment I am running the farm single handedly, so time is not always on my side, and I always have lots of irons in the fire at one time, as you can tell, but I will do my best. Is it Possible to make Money from Chickens? You have to have animals that work for you. If you are working for your livestock more than they are working for you, they should be replaced with something that does. I live on a small farm of 15 acres. My poultry roam a 2.2 hectare field of rough terrain with 12 hardy Finnsheep and 6 Angora goats. How do we Make Money from Chickens and Ducks? I keep chickens and ducks. I had turkeys but found that they were more trouble than they were worth in my set up. Not that they were difficult to look after, but they were definitely not as hardy as my ducks and chickens. If I have flowers that sulk in my garden, they soon go. 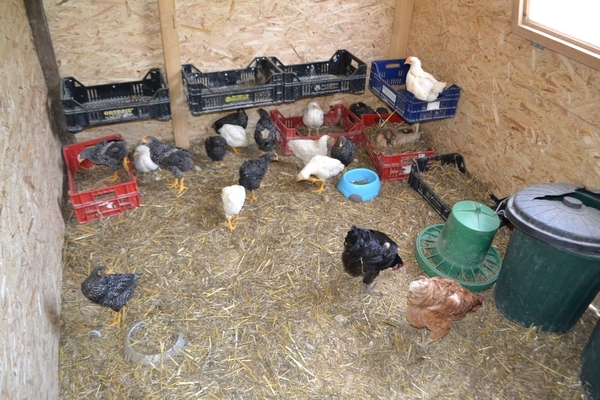 The same with my poultry and livestock. We sell the eggs to friends, neighbors and local restaurants. I sell just below market value. Why? Because if I didn't they could get them cheaper at the supermarket. Not only are they getting fresh eggs, but they also know that the chickens are well looked after, raised organically (without the certificate - a headache I don't need), and I am getting return customers. In fact, I cannot keep up with the demand for my eggs. From time to time we raise chicks artificially in an incubator and then sell them at 4 - 6 weeks old. I could get more for them than if I sold them as pullets, but then I don't have to spend weeks feeding them either. So, you need to work out whether it is more profitable to sell them as either day old chicks, at a little older, or as pullets close to laying/slaughtering. Eat your chickens! Although this is not making money from chickens directly, it is indirectly as I don't have to go out the local supermarket and purchase chicken anymore, thereby making a saving. As long as you don't name them, and treat them like pets, eating your chickens is a way of making savings on your grocery bill. When you incubate eggs about 50% of your chicks will be roosters, and so these are the ones you will be dispatching, along with any other hens that show deformities so that these are not carried into the next generation. As I said before, our girls free-range for most of the year. I say most, because there are a couple of months out of the year that I cannot let them out due to predators. We lost a lot of chickens and a few ducks this year to a very pesky fox. However, after buying 2 guardian puppies this year, we are hoping that this will be the last of the problems. By free-ranging the poultry it saves you feed. If you can grow some of their food on the farm, even better still. Feeding your chickens will be your biggest cost. The more you can grow for them, the better. Chickens will do well feeding on rice, meat scraps, kitchen peelings and scraps, spent veggies from the garden, fruit from the orchard, and they love rice, which is helpful, considering that it goes a long way. For more details go to our page on what chickens eat. What do Chickens Eat? If you don't keep your chickens in clean, dry, draft-free housing they will get sick, or worse die and your profits will be eaten away with vet bills, medication and loss of poultry stock. So twice a year we strip the deep litter system back to bare earth, sprinkle the area with dolomite and then replace the litter with a generous layer of straw. Once a year, on the second stripping back, just before spring, we bring out the Scrubb's Ammonia and scrub every nook and cranny, every roosting bar, wall and joist, making sure that everything has been thoroughly disinfected. Coccidiosis is one of the worst diseases, but also common diseases to chickens and ducks, cats and dogs too for that matter, and so by disinfecting the coop thoroughly once a year, we safe-guard our chickens and ducks against such a calamity. You are a poultry farmer for a reason - to make money. Keeping roosters that are infertile, or chickens that are below average layers is costing you money. They are not pets. They are working animals that have to earn their keep. As a result you need to identify the ones that need culling. See it as a bonus. They will be filling up your freezer and saving you money in your food bill. When you keep chickens you have foxes. It is an old adage that is so true. Not only have we lost poultry to Mr. Wiley Fox or Mrs. Wiley, as the case may be, we have also lost quite a number to stoats. How do we know this? Well, besides me watching a fox take a chicken in broad daylight one early afternoon, from right under my nose, you can see from the evidence left behind. If you see just a few feathers on the ground your poultry has been taken by a fox. If you arrive to see just headless bodies lying around on the ground your poultry has been attacked by a weasel or a stoat which usually happens late at night, or very early in the morning. Your chickens deserve your protection, thus the purchase now of the guardian dogs. Electrifying fences also works, as does hanging radios from tree branches in plastic bags played at full volume! Although this could also be annoying for your neighbors if they are close by. If you lose stock unnecessarily, by providing a buffet for your predators, your profits will decline and it will take you a long time to get back to productivity , especially if you lose them like we did this year. In one day we lost 40% of our flock when a stoat/stoats caught our girls early one morning including my beautiful rooster and left their lifeless bodies littering the field. It was a traumatic time picking up the bodies; so senseless, so heartbreaking. It has taken us a long time to get back to where we were before with egg production as we had just put eggs into the incubator and decided to keep these for ourselves, rather than replace the lost poultry with adult birds. We are hoping that the dogs will finally give our girls the protection they deserve. Are you raising chickens for meat or for eggs? Are you going to raise them for dual purposes? Once you have decided, you need to make sure that you buy in the best chicken breeds for each purpose. If you don't, and you end up with just any old chickens you will be feeding them and not getting what you want out of them, at the end. If you want to make money from chickens you have build up a good flock. You want to keep the best there is, and to do that you have to be selective when it comes to breeding time. Cull or sell off the poultry that don't make the grade, and just keep the ones that meet the breeding standards for that breed of chicken. After several years of selective breeding you will end up with a superior chicken which will increase levels of productivity, resulting in more money. Do you know exactly how much your poultry is costing you? Are you in the red or the black? If you are in the red, how can you change your loses into a profit? Are you selling your eggs and chickens below market value? Are they costing you more in feed than they should be doing? How can you adjust that without getting a drop in egg production or meat weight at slaughter? If you don't keep your receipts you cannot hope to know whether you are running your farm at a profit or a loss. Sloe gin is fun and easy to make, and you just need 3 ingredients and patience enough to leave it for 2-3 months before drinking it! Wash your sloes and check for blemishes. Discard those that are either blemished or shriveled. Take your washed sloes, gather all the family around the kitchen table and give them each a toothpick. 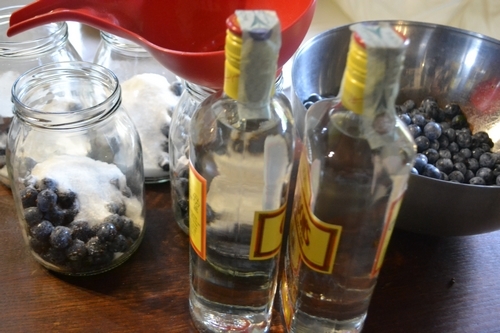 Now get them to poke holes into the sloe fruit about 6 or 8 times so that the gin is able to get to the fruit. Take widemouthed quart jars and in each place 500g (just over 1 pound) sloe berries. Pour over 250 g (1/2 lb) (of sugar, and over that, 500 ml (1 pt) of gin. place on the lids and shake the jars gently once or twice. Leave for 3 days shaking several times a day until the sugar has dissolved. Now put your jars out of the way for at least 2 months. After that, remove the lids, rack off the liqueur into bottles. At this stage you can have a small taste - emphasis on the word SMALL, and see if you need to add any additional sugar to sweeten, if necessary. Leave for another 2 weeks before drinking. Enjoy! Sloe gin is a special country liqueur for Christmas that may well become part of your Holiday Season traditions!